Pale pink flowers with deeply cut petals over deep green foliage in mid summer. This is an easy plant to grow with more or less evergreen foliage making dense tufts of growth up to around 10 cms or so in height. 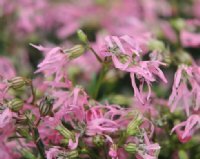 The flowers are very attractive being a pale pink and having deeply cut petals giving it it's common name - Ragged Robin.